The facility is closing at 6:30 pm. The thermal bath offers cafeterias serving hot and cold food. 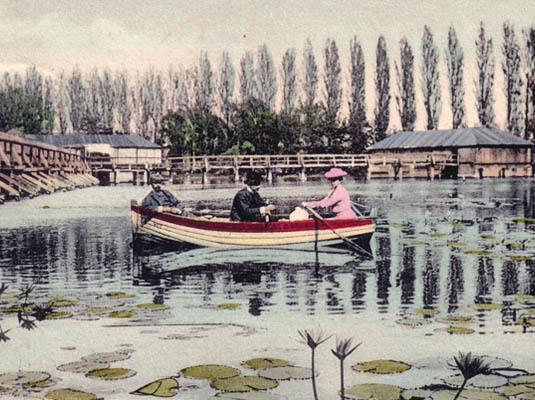 The water-lily which became the symbol of the Lake was planted into the lake by Sandor Lovassy in 1898. 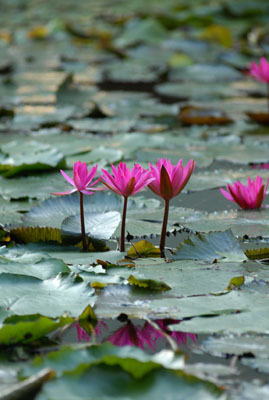 The original plant was the Indian red water-lily, but since then it started to have three colours: pink, white and purple. Water-drinker are also using the water of Heviz. The lake is surrounded by a park and forest belt, which is also called “protection forest”, as the trees protect the lake from the wind and other environmental impacts. A walkway with benches is established around the thermal lake, where everyone can have a feel of the special atmosphere of the lake. As a result of the evaporation of the hot water a steam layer covers the lake (especially in cold weather), which guarantees pollen free, clean air to the guests. We can access the main entrance of the lake via the Dr. Schulhof Vilmos Promenade. The promenade is bordered by hundred years old sycamore trees and colourful flower beds. The lake is situated on one side of the promenade, while the other side is bordered by houses built in the beginning of the 1900s, which are connected to the lake and nowadays belong to the Saint Andrew Rheumatologic Hospital (Szent András Reumakórház). Originally these two-storey buildings, mainly built in Art Nouveau style were villas and apartment houses. Within the territory of the thermal lake characteristic pinnacle bathing buildings can be found, which went through significant reconstruction works in the past few years. The half-timbered buildings built on stilts preserved their original style. The pinnacle buildings are also very spectacular in the evening, when their lit image is reflected from the water. 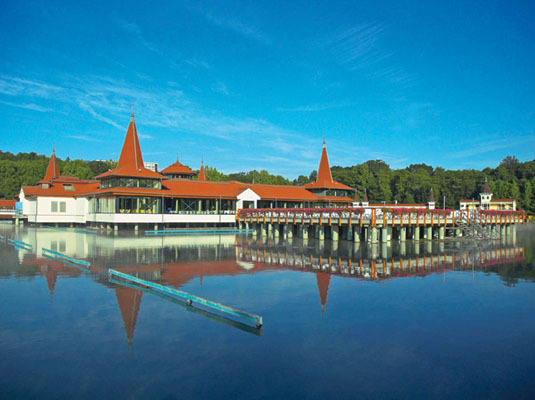 Hévíz Thermal Lake is not only a natural rarity, but also a place which has a positive impact on human health, as this biologically active lake is the largest lake in the world, which is suitable for bathing. The lake is situated in a beautiful green environment, in a natural preserve area of 60.5 hectares. Biological activity means, that as a natural lake it is part of the natural environment, boosts a rich flora and fauna, furthermore the lake’s water is continuously exchanged, i.e. it is motion all the time. Water-lilies are the most common plants in the turquoise coloured water of Hévíz Lake. Pink, purple and white water-lilies are continuously blossoming from May to October. Several kinds of fish (e.g. crucian carp, bream), amphibians (e.g. marsh tortoise), birds (e.g. pochard) and tiny micro-organisms populate the lake’s water. During the winter – as the water temperature does drop below 24 ºC –swans also use the lake as a retreat. The Romans already knew… According to an ancient story the spring feeding the Lake of Heviz was created by the Holly Virgin, who was listening to the prayer of a Christian milk-nurse asking for the recovery of a paralysed child. Due to the warm water of the Heviz Lake from the depth and the healty smoking mud the week body of the child had fully recovered and had become healthy. In the legend from the Roman era the child wishing to recover is the imperator of Eastern Rome, Flavius Theodosius itself, who made the Christian religion the religion of the state in the Roman Empire in A.C. 391, after his recovery. The spring breaking-forth with its abundant water supplying capacity has been supplying the unique Lake of Heviz ever since, where the tradition of bath (internal link) developed and reached the level of the world. 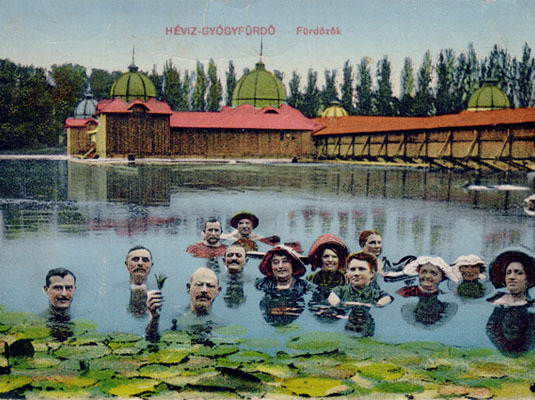 It was the Festetics family that started to use the health-supporting effect of the Heviz Lake in forms of bath cures. The real development of Heviz started in the middle of the 18th century. At that time the Lake and its surroundings became the property of the Festetics family. Count George Festetics (1755-1819) started to have the bathing resort built. He had bath-house built and organized the medical service, and started to advertise the beneficent and curative effect of the water from the spring. In 1796 an inn and a barn for the horses of the guests had been built. Next year upon the order of George Festetics a barbecue-tent was established for “ordinary people”. The first bathing house was built at the beginning of the 1800’s. The Festetics estate consciously invested significant amounts in order to implement the planned bathing resort. 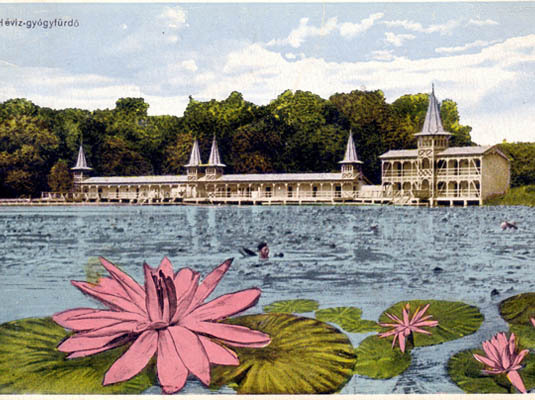 From the 19th century Heviz became famous on abroad, during the era of the Monarchy it was a fashionable bathing resort. After the Millennium the development of the bathing resort fastened up, between 1904 and 1928 it received the form we know today. This is the era from which up-to-date medicine was available in Heviz. The classic cure of Heviz (internal link) always starts with a consultation with a physician, where the treatments for the guest wishing to recover are tailor-made by the specialist considering the indications and the contraindications of the spa. (internal link). Applying the water of the Heviz Lake equals to a complex therapy itself. The hydrostatic pressure and the mixed direction of the flow are ideal for the blood circulation. The indifferent temperature is close to the temperature of the body results a pleasant refreshing bathing. When prescribing the cures of Heviz the specialists are always consulting the other specialists. The weight-bath is the local speciality out of the cures available in Heviz (internal link). In addition to this there are other techniques used frequently, for example the autogene training, ergo therapy, guidance on alimentation issues, and the special curative massages (interstitial tissue massage and segment massage). On top of the medical background and experience of more than 200 years, together with the laboratory providing result it is ambient that supports the efficiency of the recovery to a great extent. On the natural lake due to the reflection the effect of the sunbeams is increasing, and due to the forest protecting the Lake and the evaporation the neighbourhood of the Lake is free from dust, the air is poor in allergens. Danubius Health Sp…HévízKossuth Lajos utca 9-11. Danubius Health Sp…HévízKossuth Lajos utca 13-15. Hunguest Hotel Hel…HévízVörösmarty Mihály utca 91. KISS11 ApartmanHévízKisfaludy utca 11. Apart Júlia VillaHévízZrínyi Miklós utca 38. Hunguest Hotel Pan…HévízPetőfi u. 9. Hotel Spa HévízHévízDr.Schulhof Vilmos sétány 1. Hévíz Castrum Gyóg…HévízTópart Hotel AquamarinHévízHonvéd utca 14. Korona Panzió Étte…HévízSzéchenyi István utca 43. Palace Hotel HévízHévízRákóczi Ferenc utca 1-3. Williams'HausHévízDr. Babócsay József utca 12. Erzsébet HotelHévízErzsébet királyné útja 13-15. Villa NegraHévízDr. Babocsay József utca 1. Gelencsér PanzióHévízSzéchenyi István utca 30. Piroska ApartmanházHévízSzent András út 21. Corner ApartmanházHévízKisfaludy Sándor utca 88. Holiday Club HévízHévízVajda Ákos u. 3. Antal HázHévízZrínyi Miklós utca 35. Hotel NapsugárHévízTavirózsa utca 3.